If you live on the East Coast and haven't looked at a hurricane sandy power outage map, now might be a good time to do so. 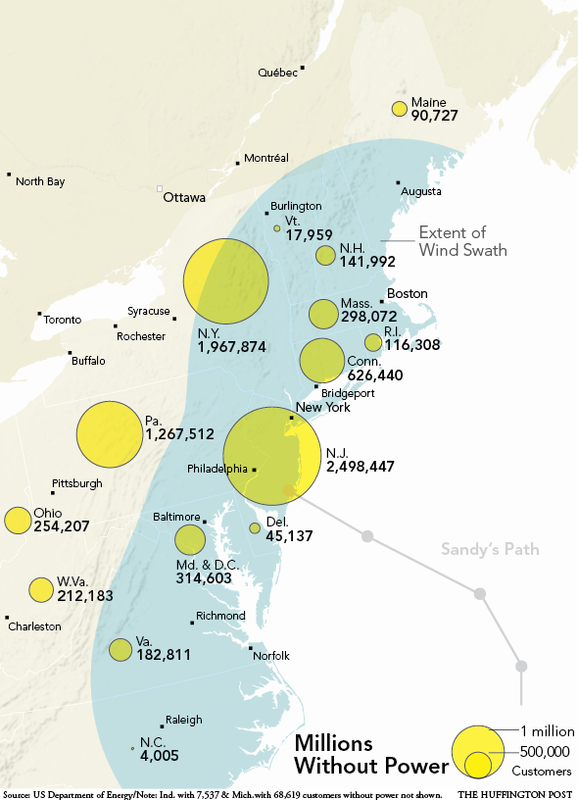 Hurricane Sandy power outages have hit millions of people and businesses along the East Coast over the last day. In New York City, Consolidated Edison (ConEd) lost a substation to a massive explosion in the East Village neighborhood. New York Mayor Michael Bloomberg said in a press conference Tuesday morning that 750,000 city residents were without power after the storm. ConEd warned on Twitter that customers in Manhattan currently without power will have it restored in 4 days, and that all other areas served by overhead lines will take up to a week. Power outages in New Jersey and Pennsylvania have "shattered records" with over 3 million without power according to Philly.com. Three nuclear reactors were shut down and a fourth facility is on alert because of the storm. Sandy has even left 145,000 Canadians without power. The historic levels of power outages along the coast will unfortunately help contribute to the historic potential cost Hurricane Sandy is anticipated to incur -- an estimated $20 billion dollars. For more information and updates on power outages, please check with your local power service provider, many of which are providing maps of hurricane Sandy power outages. Use common sense, don't approach downed power lines even if power in your area is off, conserve your batteries and remember that if you're burning candles, it can be a fire hazard if you're not careful. For more tips on how to deal with extended power outages, visit the Red Cross Power Outage page. Visit our Live Blog for continuous updates on Hurricane Sandy.